A Thousand Words Project Gala | Connectability, Inc.
A Thousand Words Project Gala and Fundraiser is an annual celebration of the work of our artists and benefits ConnectAbility. Ticket includes dinner, dancing and the opportunity to meet the photographers and take home a unique image captured by our teams. Using photography as a medium of self-expression gives the photographer, with the single click of a button, the ability to create images that capture their own stories, emotions and adventures. Our 2018 Thousand Words Gala took place on February 24, 2018. We had a great dinner, music and dancing. Our special guest was Melissa Peterman and we enjoyed celebrating the accomplishments of our ten photography teams. 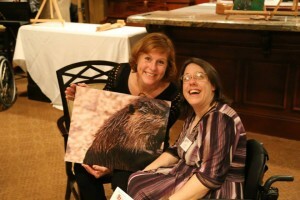 Thanks to the generosity of all our guests, ConnectAbility raised $30,000 to support the Thousand Words Photography Project programming and other ConnectAbility programs to serve children and adults with disabilities and their families.